LILA IN A NUTSHELL: Lila was taken in as an overweight, slow moving senior, and has proven herself to be anything but. Now that she has shed over 20 pounds, she has a lot of energy and is nowhere near the 8 or 9 years she was purported to be originally. She's a slim, trim, healthier version of her former self and she has the energy to keep up with a long walker or a runner. Don't count this girl out just yet; she's got a lot of life left in her and a lot of love to give. 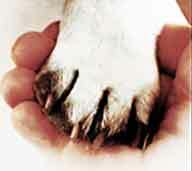 She is perfectly crate trained, is a good and watchful companion and would do best as an only child. No small dogs, no cats. We received an email from our dear friend, Michael (who adopted Sawyer and Amy [formerly Brianna] from our rescue), about a senior girl who was going downhill quickly in a Las Vegas shelter. We had to investigate further. What we found was heartbreaking. 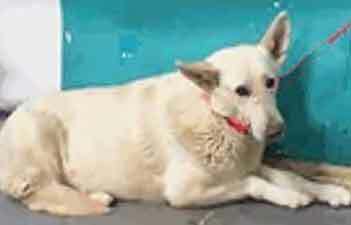 Lila is said to be 9 years of age and was DUMPED by her family at the shelter -- no reason given -- on June 11th. As the days went by, Lila's stress increased as she struggled to understand what had happened to her life. It is incomprehensible to her that her family could have done this -- left her in a high kill shelter and simply walked away after years of (her) loyalty and love! 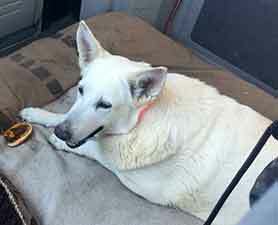 The stress must have been unbelievable for this trusting senior, and her attitude and behavior deteriorated. We reached out to our Vegas friend, Becky, who put the wheels in motion immediately to save Lila. A check at the shelter told us that, thankfully, Lila was still alive. This shelter will not release an unaltered animal, so even though we would prefer to have any surgery done later and at our vet, Lila will be spayed either today (June 20th) or tomorrow, then released. She will be taken to Becky's vet to be taken care of and allowed to decompress until her transport to Phoenix on Saturday. If you would like a tax receipt for your donation, your donation must be processed through CABRA (Coalition of All Breed Rescue of Arizona), a 501c3 to which we belong as a participating member rescue. 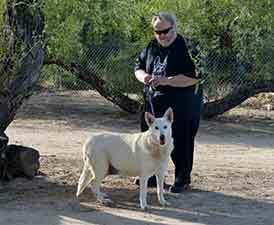 Note on the check "For the benefit of White GSD Rescue (Lila)"
LILA's ANGELS ~ THANK YOU!! 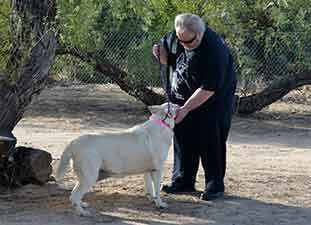 We have requested additional photos of Lila as she leaves the shelter and begins her long journey. 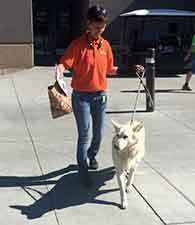 A shelter worker walks Lila out via the FRONT DOOR! UPDATE 6/21: Our thanks to Shari who persuaded the shelter to release Lila unspayed into our care and for also picking Lila up at the shelter and transporting her to the vet where she will be safe until transport this weekend. 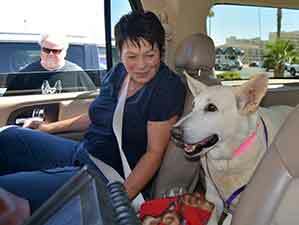 UPDATE 6/23: Two of our staff members made the 5 hour drive to Las Vegas today to bring Lila home to Phoenix. 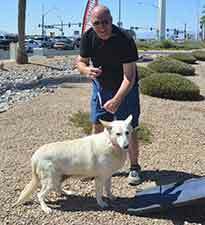 Our thanks go out to our dear Vegas friends, Phil & Becky, who not only picked Lila up at the vet's office and transported her to meet our vehicle, but also paid her vet bill and donated additional money for her care! We love you Phil & Becky!! Hi, Stella! Are you headed to Phoenix, too? Why can't I sit up front? Lila arrived safely in Phoenix around 9pm and was fed, watered and tucked into bed for a good night's sleep. She will be paired with our gentle Niles tomorrow to see if having a friend is something she'd like to do. She will obviously need to lose some weight and will be seeing our vet for an intake exam, bloodwork and spay surgery. Please check back for updates on this lovely girl. She's very spry (she had no trouble jumping up into our transport van) for a 9 year old and we can only imagine how much more active she will be once she loses about 20 pounds. UPDATE 6/26: Lila has started on her "green bean" diet and she loves them! No problems here trying to get this girl to eat healthy. It's just the first step on her long road, and we'll be with her every step of the way! And lets you k now He's there. You cannot see their wings. The home where you can live. 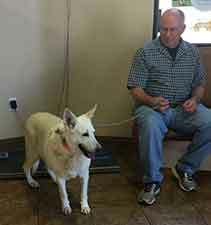 UPDATE 8/14: Lila saw our vet today for her checkup and weigh-in. 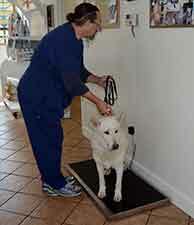 She weighed in at an antonishing 75.7 -- a loss of 19.7 pounds!! She was pronounced in good health and ready for her spay surgery, which was scheduled for Monday, August 20th. The vet also confirmed our suspicions that Lila was not a 9 year old but more like a 4 or 5 year old! She has not been taken care of nor treated well during her life, but we'll make sure things continue to improve for her. UPDATE 8/20: Lila had her spay surgery today and came through without complication. She's definitely been used as a puppy factory, but the surgery went off without a hitch. She was also microchipped and updated on shots. After a suitable recovery period, Lila will be available for introductions and adoption. UPDATE: Lila continues to thrive in her foster home with one of our staff members. She has lots of energy and definitely is NOT a senior citizen by any definition. She would do best as an only dog as she can be selective with other dogs -- definitely NOT a small dog "person" mor a small animal of any species fan. She has an outgoing personality and is always raring to go. She rides well in a vehicle and is always ready for a new adventure ~ she's just looking for the right family to love. If you are interested in Lila, please fill out our PROSPECTIVE ADOPTER'S QUESTIONNAIRE. You will be contacted by return email. If you do not receive a response within 24 hours, please Email Nancy at WhiteGSDRescue@AOL.com. 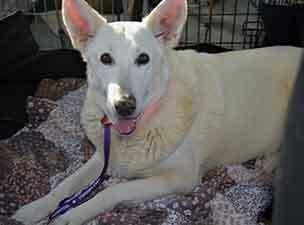 This questionnaire link is only for Lila or other white German Shepherds on our site. WE WILL NOT CONTACT YOU until a questionnaire has been completed.